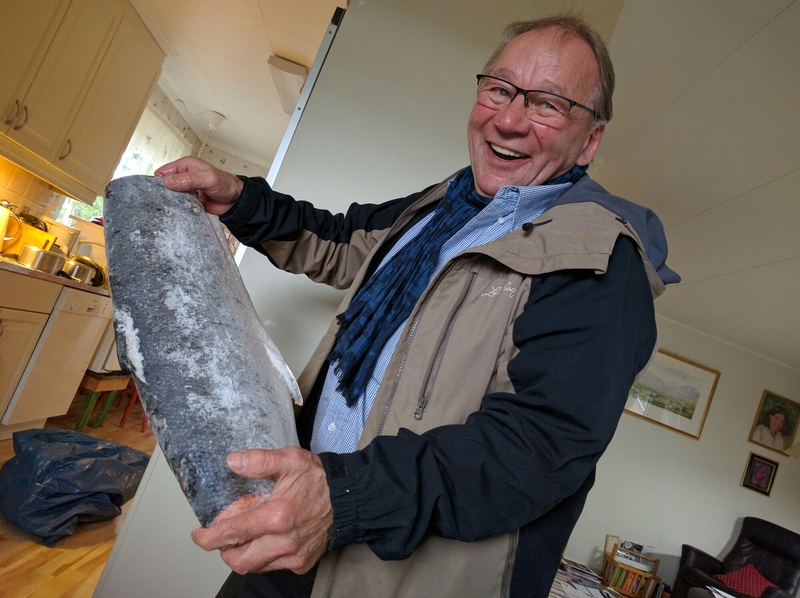 Oddbjørn stacks the king crab legs in segments, showing me the difference between the big one caught in the deep ocean and the smaller ones caught in the fjords. The same joint is almost twice as long. “A big, big one!” he says holding his arms wide to show the length of the full crab. His eyes sparkle, delighting in the knoby, armored plates like they delighted in the fillets of cod and the huge salmon he showed me yesterday. He stacks the legs one by one into a pan of salt on the stove. The dark purple shells turn red in the heat. His enthusiasm is infectious. I can see why Asfrid fell in love with him many years ago. She was teaching and had to take a ship home because the roads had closed. Oddbjørn was cooking on that ship. He is still cooking today. When I asked him if cooking was how he won Asfrid’s heart he smiled at me. “Have I got it?” he said, laughing. That’s his true secret, there in the question, the truth that you can never take a heart for granted, that you should always try to win it, from the day they met on the ship to now, day by day, moment by happy moment. Posted in Europe North to SouthTagged cooking, ENS, Europe North to South, featured, food, hiking, Lakselv, life advice, love, salmon, trail angelsBookmark the permalink. Now that is a salmon! Great story and reminder D. Thanks Asfrid and Oddbjørn for your generosity, kindness and example. I meant “theirs” not “yours” — too funny. Great to hear about the bounty of our planet in a far away northern sea. And the truths of love are universal it seems! Wonderful story! Lovely people! Amazing seafood! bounty! You are sure one lucky fella. Did you invite Asfrid and Oddsbjorn to visit? I would love to meet them!!! So enjoying your writing and journeying with you!!! Was the salmon as delicious as it looked?